Homer tells the story of Odysseus—also known as Ulysses—a respected warrior who is returning home, to the island of Ithaca, from the Trojan War. It’s a war the hero never wants to fight in the first place. It isn’t that he is afraid to fight. His concern stems from an oracle’s prophecy predicting that if he fights, his post-war journey home will take a really long time. Odysseus doesn't want to leave his family for such a long time, so he pretends to be a lunatic. His efforts to avoid the conflict fail, however. He ends-up fighting in the Trojan War (during which he becomes a hero). The Odyssey is Homer’s tale of Odysseus’ homeward journey, after the Trojan War is over. Likely written during the second half of the 8th Century, BC, The Odyssey was popular throughout the entire Mediterranean region. We know this because artifacts, like Greek vases, depict aspects of the story. Why is The Odyssey still popular? It’s a timeless and fast-paced tale which features a hero on a seafaring adventure traveling through exotic lands, enduring terrible storms and horrifying monsters. All of this is set against an enthralling, supernatural atmosphere where gods move around in humble disguises so they can be involved in human activities. Those gods, of course, are capable of casting spells and curses. They can predict things, which actually come true, and their warnings to humans can help people avoid catastrophes—provided, of course, that they heed the warnings. At the center of it all is a human hero called Odysseus (Ulysses) who is a sympathetic, complex man. He tries to do the right thing and usually pays attention to what the gods tell him. The picture, illustrating this story, is “Ulysses and the Sirens,” an oil-on-canvas painting which John William Waterhouse (1849-1917) created in 1891. The original painting is maintained at the National Gallery of Victoria (in Melbourne, Australia). Why Should We Care about Odysseus and the Sirens?Image, described above, by John William Waterhouse. Public domain. Bos, Carole "Odysseus and the Sirens" AwesomeStories.com. Jan 18, 2016. Apr 18, 2019. 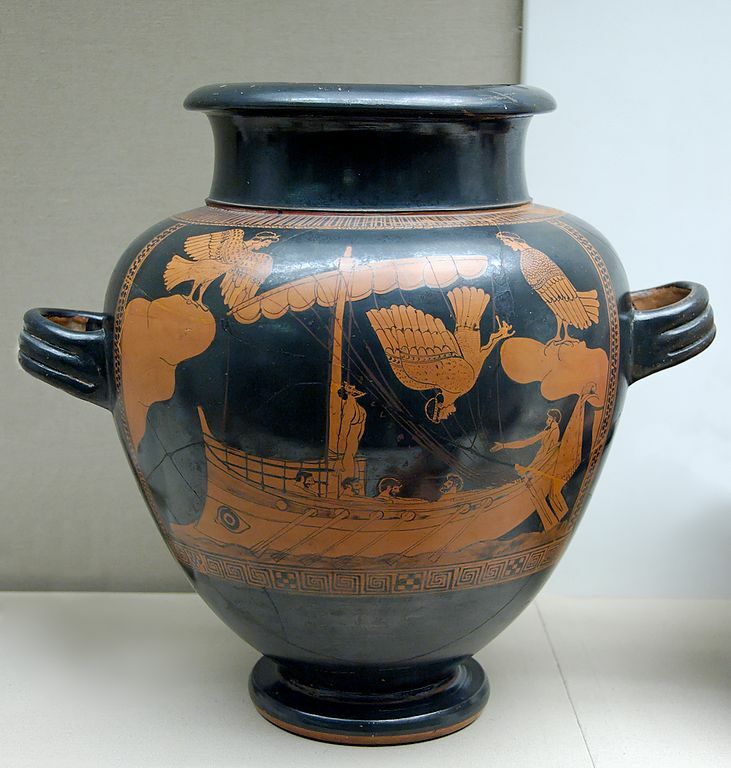 Why Should We Care about Odysseus and the Sirens?